and we do micro soldering repairs! Ship your devices for board level repair! No fix - No fee! If we don't already have the lowest price, we will match the lowest price of our local competitors guaranteed! we do micro soldering repairs! At CellPhoneFix we bring back to life all of your electronic devices! Select Your device type and option to repair. Select available date and time. Fast, Affordable Repair for All of Your Electronic Devices! Computer, iPhone, iPad, and iPod Repairs are Our Specialty! Have a broken screen or other damage to your iPhone, iPod, or iPad? We fix hundreds of Apple devices a year! 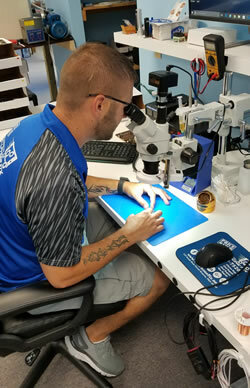 Cellphonefix.net also offers the following services: computer repair, cell phone repair, virus removal, computer servicing, system reload, game console repair, custom built PCs, projector repair, and more in the Greater Cincinnati area. Call us today! We repair all iPhone and iPad models, Samsung Galaxy and Note models as well as some additional cell phone brands. iPhone screens can be replaced in as little as 25 minutes, and we use only high quality, original OEM replacement parts. And you get a 90 day warranty on all repairs! Call us today for a professional quote and great service. © Cellphonefix.net 2017. All Rights Reserved.